Fairmont Orchid Gold Floor Worth It? I was looking forward to our United First Class flight from Hawaii back to NYC, even though it was a red eye, since I knew the seats would be so much better than Alaska's “first class” seats that barely recline. 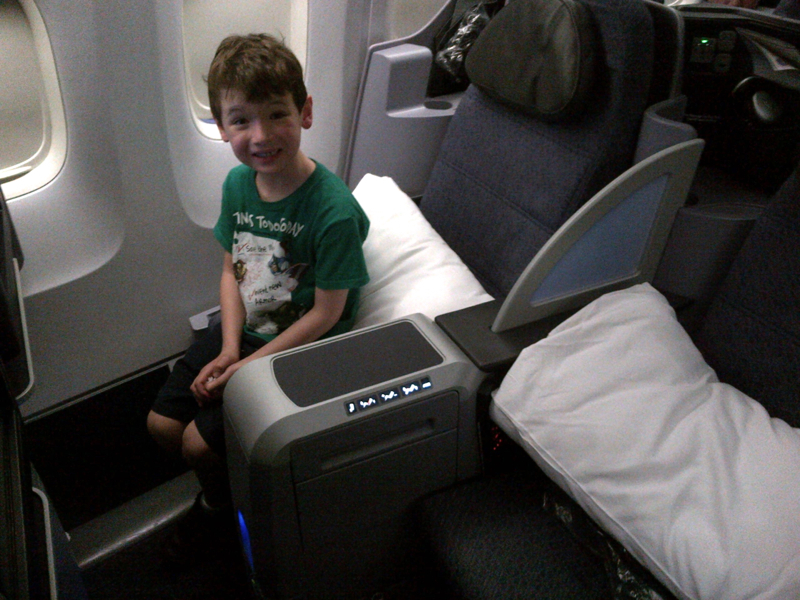 I even had fond memories of flying to Hawaii on the 767-400ER in BusinessFirst during its Continental days, when the munchkin was just a few weeks old and fit in a bassinet. The seats back then weren't fully flat, but had great recline and were about as comfortable as it gets for non-flat bed seats. 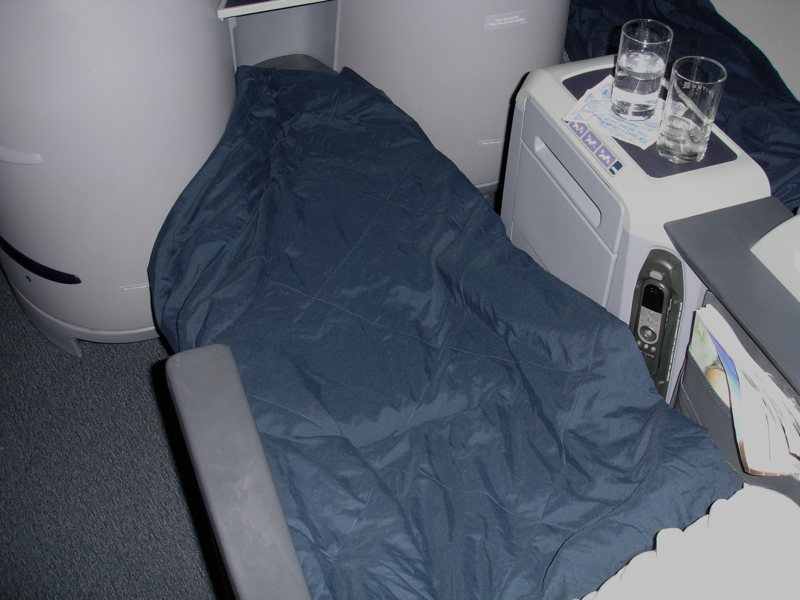 Since the United Continental merger, United has installed flat bed seats, but nevertheless kept the unusual 2-1-2 configuration. This probably works well on flights to and from Hawaii, where many people are traveling with a spouse, partner or friend, although it's a strange configuration for any business class routes (Lufthansa's New Business Class with its 2-2-2 configuration notwithstanding). Back to our flight. We had in part arranged our trip dates to coincide with being able to book two award seats (using Ultimate Rewards points from the Ink Plus) on this route which can be very tough to get, with only 39 seats total, and United understandably stingy about releasing many on the only nonstop NYC-Hawaii flight with flat bed seats. While the seats aren't that wide as business/first class seats go, at just 21 inches, there was plenty of legroom, as you'd expect for flat bed seats. 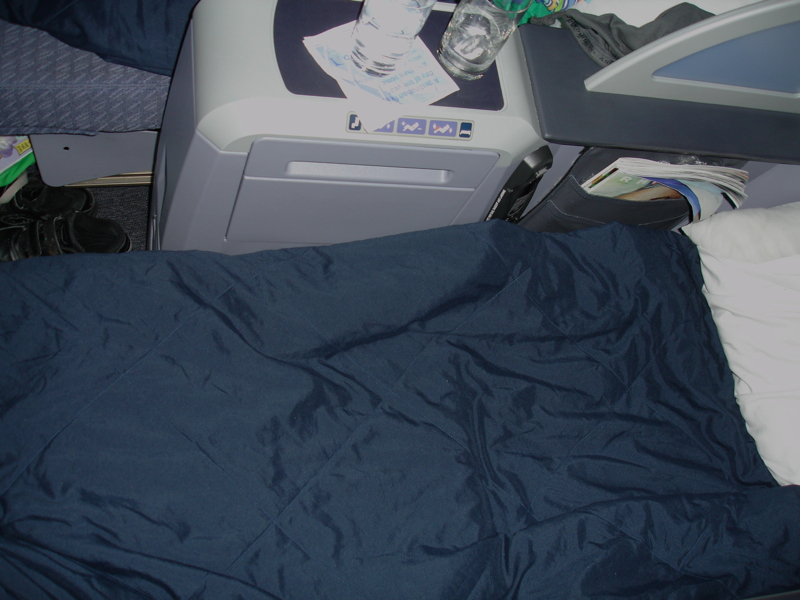 A light duvet and pillow was on each seat. The munchkin loves night flights, since it's one of the few times we allow him to watch movies, so he was excited for the flight to get underway. Take-off was uneventful, and even before takeoff I explored the various film options. The munchkin wanted to watch Disney's Cars 2, as I toyed with the idea of rewatching All About Eve, but decided I should at least try to rest after the meal. As it turned out, we should have had a full dinner before boarding, since the light meal was pretty much a joke–just a few veggies with some salami and Israeli couscous (also known as pearl couscous), crackers and a small bowl of fruit–that was it. Good thing I had some cereal with me for the munchkin. Fortunately the flat bed helped to make up for going to sleep hungry. While I dozed rather than slept, I've almost never been so happy to have a flat bed, given that it was a night flight and the memory of Alaska Airlines was still fresh. And the munchkin at least slept very soundly. 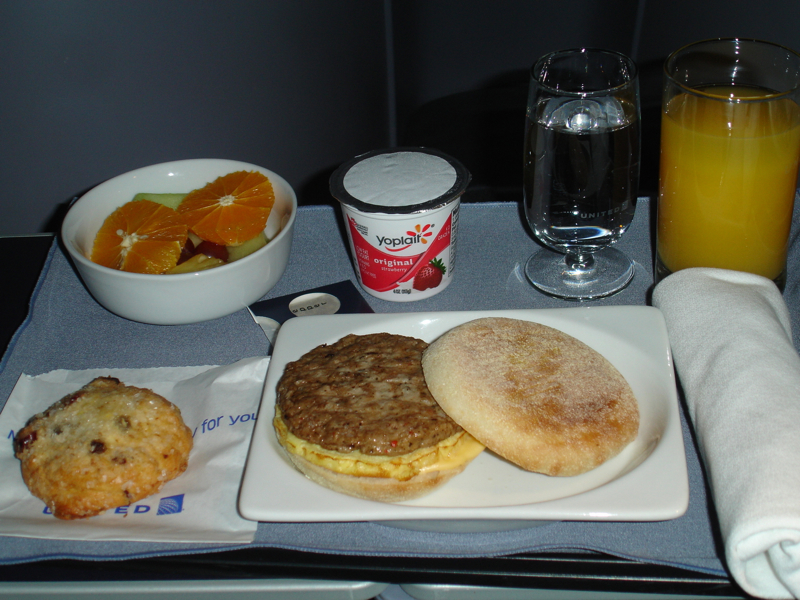 Breakfast before landing in EWR was a bit better, mainly thanks to the yogurt and scone, even though the heavily processed egg and sausage sandwich seemed like it could have come straight from McDonalds or other fast food chain. I saved a yogurt for the munchkin, since he slept right up until the time when I had to return his bed to an upright seat position for landing. It's been awhile since I've flown United for any distance, but I was happy with the hard product, given that this was a domestic first class flight. In general, give me a clean cabin and flat bed seat and I'll be very happy with the hard product on a domestic long haul flight. 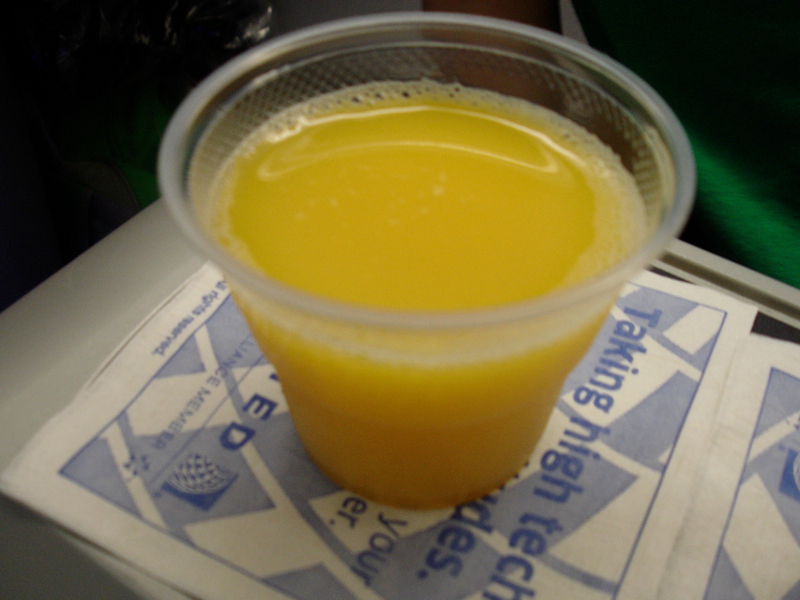 The service was perfectly fine as well for a domestic flight–the flight attendants were friendly, perhaps not quite as much as I remember the Continental crews I had a few years back being, but still very nice, so no complaints there. 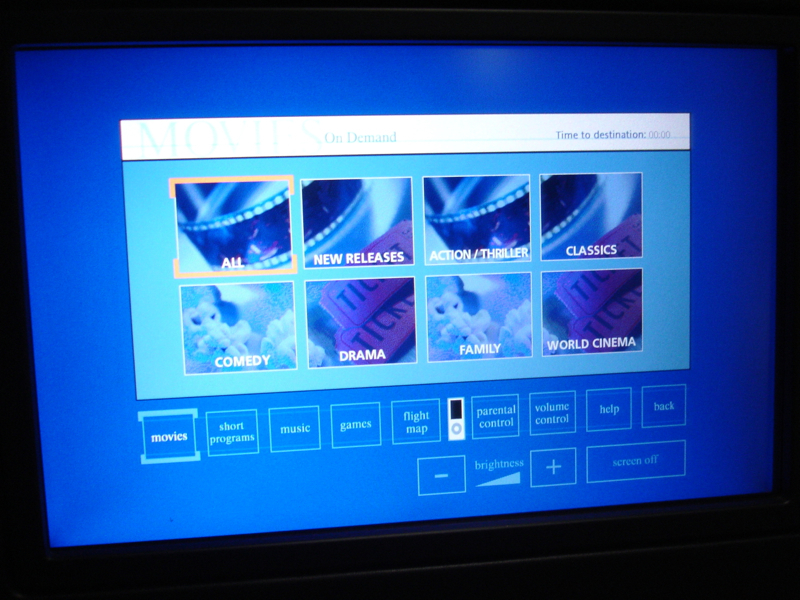 The IFE worked well for our purposes, so as long as you're not expecting a library like selection, Singapore Airlines-style, you should be fine–plus so many of us bring our own entertainment and devices these days anyway. 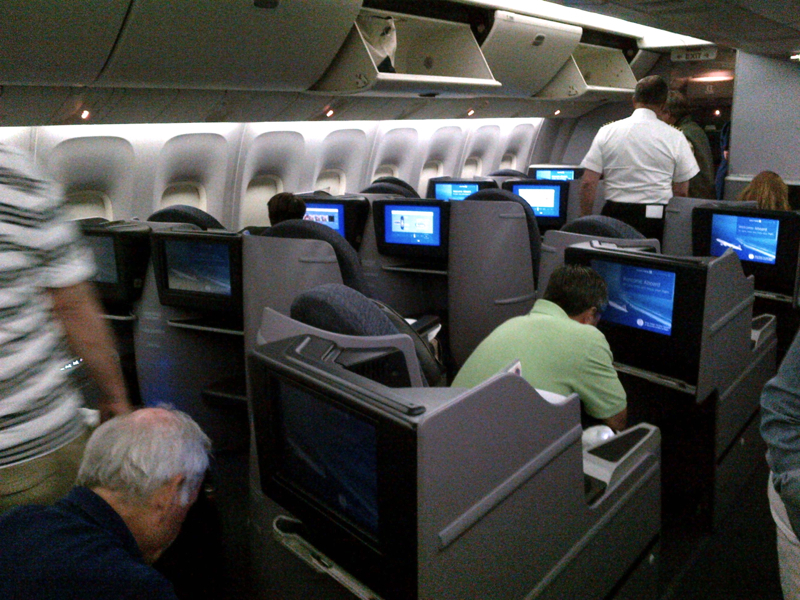 If you've flown United first class on the 767-400, what was your experience? 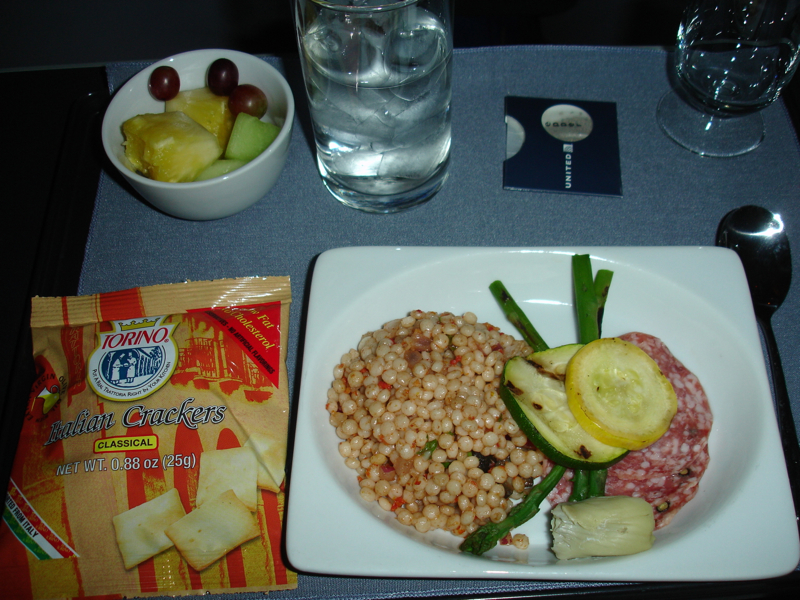 2 Comments on "United First Class Review Hawaii to NYC"
Israeli couscous refers to a certain type of pasta made of wheat flour and semolina; sometimes it is also called pearl couscous.